Given the broad range of this species, it is a home to a wide range of habitats and climates. In the north it can be found on the edge of quaking bogs or growing under coniferous forest in deep pine duff, while in the south it is often seen in broad leaf, deciduous forest in association with mountain laurel (Kalmia latifolia) and other ericaceous shrubs. It is likewise at home in open oak forests of the Piedmont, or pitch pine forests (Pinus rigida) of the pine barrens of New Jersey and Long Island. It is found from near sea level to almost 2000 meters elevation – truly a plant capable of handling great temperature and moisture variance. The one thing it requires above all is a fairly nutrient poor, and very acid substrate. Everywhere this plant naturally exists has a soil pH of no more than 4.5, or lower. The reason is simplicity itself – at higher pH values the root stock is overwhelmed by fungal attack. 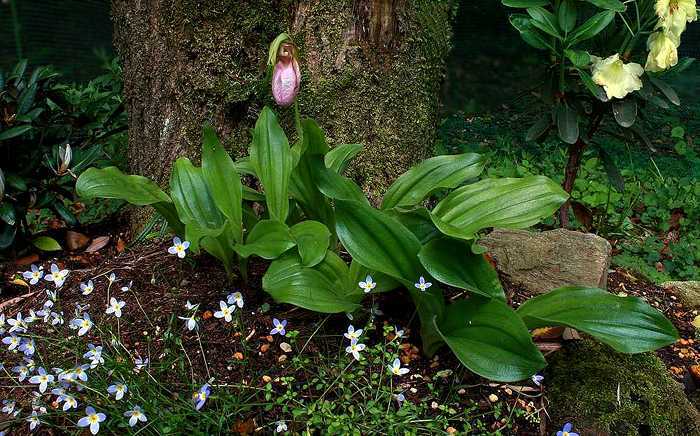 All terrestrial orchids start out life as symbionts with mycorrhizal fungi, but C. acaule seems to have taken this relationship into adulthood – loss of the symbiont fungi leads to the orchid being in jeopardy as well. It has been suggested that at higher pH (5.0 and higher), that the symbionts themselves may in fact kill the orchid. Regardless of how and why, this plant cannot live in soils that exceed the pH threshold of 4.5. We will see later on the importance of this fact for those desiring to grow this species. As I said in the introduction, this is the first wild terrestrial orchid I can ever remember seeing. It grew sporadically throughout the woodlands around my home in the lower Hudson River Valley in Westchester County, New York. Usually you would come upon a few dozen plants in a bright woodland, or perhaps under some hemlocks. Once in a while you’d find more extensive colonies covering many acres, yet still growing scattered throughout the woods. 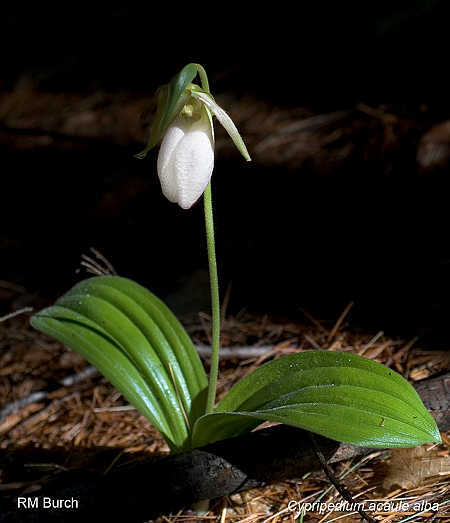 One day though a friend who knew little about plants told us of an abandoned granite mine just a few miles from our house that was supposed to be full of the pink lady’s slipper. For years my father and I had canvased the local woods intensely and had a pretty good idea of what grew within a 10 mile radius of our home, so we were a bit skeptical. If memory serves, our friend gave them a funny name as well – something like pink shoe flower – adding to our disbelief. Still, one May morning he lead us to the mine, located on the side of a moderately steep hill. At the bottom we found a large, spread-out colony of C. acaule – fairly impressive, yet typical of the area. I remember my dad and I looking at each other knowingly – another false alarm. Little did we know what awaited us however, at the top of the hill, in and around the old mine proper. Cypripedium acaule has been successfully grow in flask. These lab grown seedlings were produced by Ron Burch and are growing on his property in northern Connecticut. Photo by Ron Burch. The walk up was strenuous and our friend, a very large man, was feeling faint to the point of passing out by the time we got to the top. He sat on one of the giant slabs of granite that had been left from the mining operations that had ceased some 30 years earlier. He told us to go on without him, he needed a rest. The mine was a deep hole, yet open on one side such that it was now fully forested with black birch and maple trees rather than being filled with water. All around were massive piles of old tailings and huge slabs of granite thrown here and there. These too were festooned with young forest – primarily birch species (Betula lenta, B. populifolia, and B. alleghaniensis), but also oaks (Quercus), hickories (Carya), and other deciduous hardwoods common to the area. What wasn’t common was what was growing under them on the open ground – literally thousands of C. acaule – a few single plants, but more commonly large clumps of 5-15 stems each. In one area we counted 83 stems in just a square meter of ground! We were besides ourselves with joy, but after just a few minutes we realized we needed to get back and make sure our friend was OK. As fate would have it, he was resting comfortably in the shade just as we had left him. We woke him and made the 2 mile journey back to the car. We didn’t mind leaving quickly since my dad and I both realized we’d be back the next day to make a full survey of the area. I don’t think our friend ever attempted to go back to that place – we of course thanked him over and over again for the tip. A survey of the area made us realize the magnitude of the population. Apparently the tailing piles, some up to 20 meters deep, were the ideal place for C. acaule to establish. The surrounding wooded slopes had sizable populations of the orchid, but nothing like the concentration in the mine area itself. The soil was composed entirely of tree humus mixed with granite grit and stone, containing no loam at all. It was extremely well aerated and no doubt highly acidic. We knew that the mine had been abandoned just 25-30 years earlier, and were amazed at how quickly the forest and orchids had colonized the place. So much for the idea that orchids are only found in old growth, established forest! The following spring we found out about another mine just a couple miles away that had an even bigger population. Luckily, the first site has been protected and now is a nature preserve while the other remains in private hands. This brings me to my original hypothesis that C. acaule may in fact be more numerous today than in the past. The reason is simple – this species is a colonizer of disturbed sites where forests are recently regenerating. I’ve seen places where it grows in mature forest, sometimes quite vigorously, but no population in such forest has been as vigorous as the ones I’d seen at those mines. Since much of the forest of the northeastern US has been cut down over the years and regenerated, it is likely that this species has followed that process, with colonies waxing and waning with the maturing of the forest. This plant flourishes in the bright, young woods of a recovering secondary growth forest, but tends to languish as the trees get bigger. I have not had the opportunity to revisit either mine site in over 30 years unfortunately, but I’d wager the areas that were once flush with plants are now much more thinly populated. Likewise, as the secondary forests of the northeastern US mature, this plant will have to make do with less attractive habitat. Such is my theory. 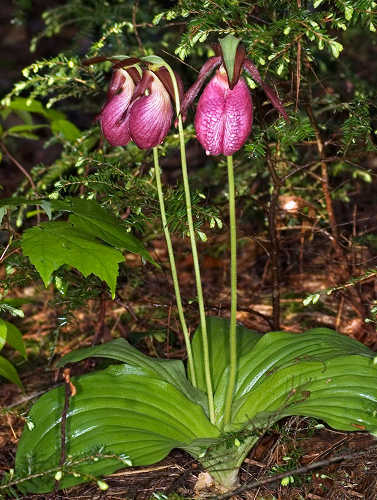 Typical flowers of Cypripedium acaule. The plant of the left was grown and photographed by Darcy Gunnlaugson. A bit about growing this plant. First of all, despite what some people will tell you, this is not an easy species to maintain in the long run. The utmost important criteria that must be followed absolutely is maintaining an acidic growing medium. If you live in a place with naturally acidic soils, you can consider growing plants in well drained beds in the garden in a lightly shaded area. If your soils are above the aforementioned pH threshold of 4.5, you will need to keep the plants in a more protected growing space – one that doesn’t allow mixing of the native earth with the plant’s growing medium. The easiest choice is an oversized pot, plastic flat, or similar container. The plants should be maintained in a well aerated, yet continuously moist compost, so any growing space must be well drained. In terms of what to grow them in – I recommend a nearly inorganic mix of mostly silica sand (watch out for “play sand” as some of it comes from sources that are neutral in reaction), any non-reactive gritty material – fine pumice, perlite, or the like, with perhaps a “taste” of acidic organic material – slightly composted conifer needles or black humus from under birch trees being two possible choices. A mix of sphagnum peat and perlite might work well in pots, but avoid it in beds since the perlite tends to float to the surface and the peat breaks down rapidly, creating a sticky, poorly aerated muck. If planting into an area that has native populations nearby you can be less fussy about the substrate, though I’d be careful about planting near house foundations or the like since concrete structures and the after effects of building them can raise the local pH considerably. Before planting I’d always test the soil beforehand just to get a baseline measurement. So, how to keep the pH low? It is well known that poorly buffered substrates such as the ones C. acaule lives in are easily subject to pH variance, and most typically towards neutral conditions. That is because the organic acids responsible for the low pH are easily leached out of the compost via precipitation, and in the garden situation that can be accelerated through watering. In nature low pH is maintained by the continuous addition of leaves and needles of trees – they decompose and give off acid on a near continuous basis. Adding partially decomposed humus from appropriate tree species (conifer duff, birch and oak leaves all being ideal choices) on at least a yearly basis may help keep the pH down. A far more reliable answer is the application of acid during watering. A method that seems to work well is diluting 10-15 ml of vinegar per liter of water (or about 1-2 tablespoons of vinegar/gallon) and using this on a continuous basis, that is, every time you water. If the plants are subject to intense rains, you may want to water more with the vinegar solution. Really, it cannot be over emphasized that the growing medium needs to stay acidic. This brings us to the issue of what water to use. Purists will say that you should only use distilled, RO (reverse osmosis), or natural rain water since they are low in minerals. I would say that watering once in a while with tap water is OK, especially in an outdoor bed, but you have to know what your water is like beforehand. Many subsurface waters, especially well water, are high in minerals and really should not be used on this species. Some shallow wells are OK, but again, you need to test the water before using it. One positive note is that once established plants in the ground will need essentially no supplementary watering except in extreme drought conditions. Of course potted specimens must not be allowed to dry out ever. One thing, if you do use tap water be sure that it is free of chlorine since this is highly toxic to the plant’s roots. Allowing water to sit out for at least a day releases most of the chlorine, but of course will not alter its mineral content or pH value. 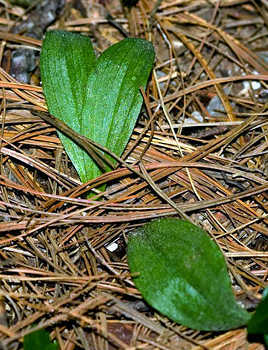 A clump of cultivated Cypripedium acaule in the garden. These are growing in a raised bed of sand, pumice, and conifer needles. If the plants show any sign of loss of vigor, they should be replanted into fresh medium, preferably after going dormant in the fall. This species has been successfully grown in flask, that is, in laboratories, and even grown on to adult size by expert growers of Cyps. Such seedlings are not for the novice gardener however. Laboratory grown plants are rare on the market, especially in the US, since wild collected material is abundant and cheap to procure. Unfortunately, such plants are more often than not poorly collected and subject to fungal infection and eventual death even if grown under proper conditions. That of course begs the question of where to acquire healthy stock – a tricky question indeed. It must be realized lab produced plants will also not be cheap, whereas “bargain priced” wild collected stock can be purchased almost on demand via internet auctions. In my opinion, if you decide the internet way, you are likely throwing your money into the wind, and guaranteeing the death of more plants. Today, C. acaule is widespread and fairly common, but other species have been lost to over collection before (especially when coupled with habitat loss). So the decision is yours to make. Thankfully, this species is very adaptable to a wide range of temperatures, growing in nature from USDA cold hardiness zones 8a clear down to 2a! Of course plants acquired from different parts of its range will probably be best adapted to a particular climate, so you should have an idea of where the original plants were sourced. Overall, I’d say this species grows optimally from zones 6 thru 4. Clearly though, temperature is your least concern for growing this beauty. 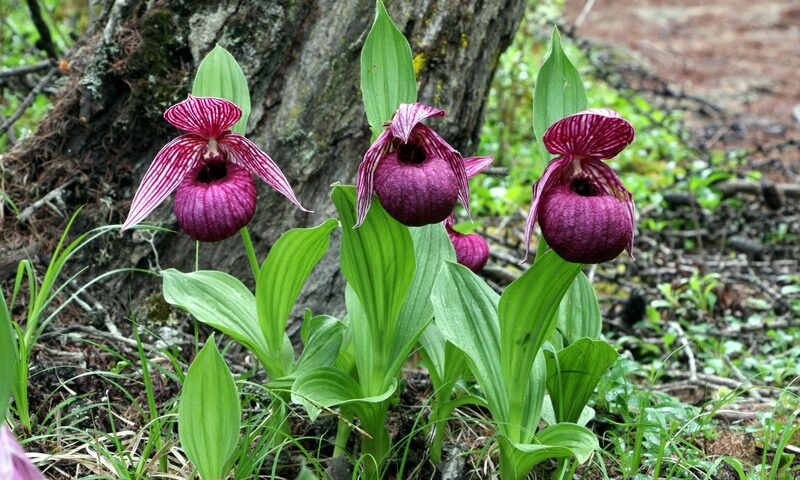 For all the above stated reasons, this iconic slipper orchid will likely remain a plant of connoisseur gardeners, and even they will have trouble from time to time. Another option is to buy new stock each fall to ensure flowers for the next spring (wild collected plants almost always flower the first season, and rarely the next), but such a choice is ethically questionable. To this day, despite advances in flasking seed and even micropropagation of Cyps, wild populations remain under threat of the spade. Still, for the time being, this lovely flower is secure, and will likely grace the woods of eastern North America for generations to come. Very interesting article. However,I’m a bit disappointed you say nothing about growing them from seed. Over several years I have been careful to look for seedpods in the fall. If you catch them at just the right stage of ripeness, you can release puffs of the extremely fine seed over the areas where you want them, and I have had some limited success with this area. Unfortunately mine are heavily browsed by deer – especially the flowers. Thank you for your in depth paper on these orchids. I have a burning question, stemming from my impatience. I have been looking for pink orchids in the woods nearby where I found several last year. I found one this evening where the flower is just beginning to form, and it is pure white. 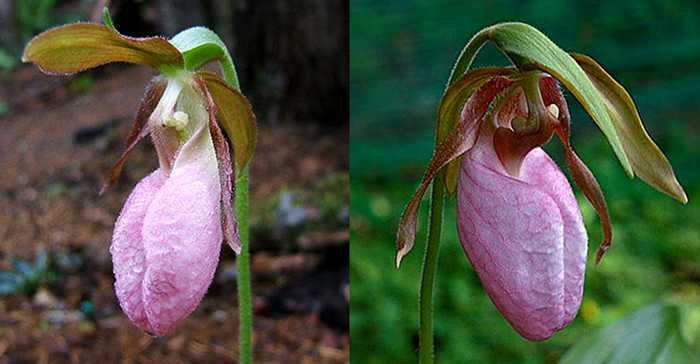 Not to mock Shakespeare, but are pink lady Slippers ‘born’ pink, or do they achieve pinkness as they mature? I have never watched one from the first shoots. Yes, the newly opened bud often is very pale, seemingly white, but more creamy. It will color dramatically within a day or two. If it is a true alba form, then the flower will become pristinely white with green sepals and petals. Some forms of this species can be very pale pink. Last year, found two in the woods. Today, found four small ones. Have never seen these in the wild before. Absolutely beautiful. Thanks for this. Have always loved Moccasin flowers. Today in my wooded front yard, under the Hemlocks, on the edge of a small, recently cleared area, I counted 42 blooms, about half of them white. I heard that each plant blossoms only every 3-4 years. Is that true? Do the plants send up leaves even if it doesn’t flower?